East meets West... this pastry combines an Asian pastry crust and a western filling. In Hongkong, the pastry usually comes with white crust (no chocolate added) and fills with sweet paste that made from lotus seed or azuki (tiny red) bean. My American husband likes Asian food, still (but it's very usual), he can care less about the sweet paste that I've described. How to make the pastry more appealing to him? The thought about it led me replace the filling; as a result I decided on chocolate fudge. The pastry crust is very flaky. Making it is much less complicated than that of European pastry. I think it should have deserved much more attention/priase worldwide because it is pretty, unique, delicious and easy! For Dough A, well combine the flour, the salt and powder sugar. Drop in butter cubes and further cut them by a pastry blender until you got the texture similar to very coarse cornmeal. Add water and form a dough. 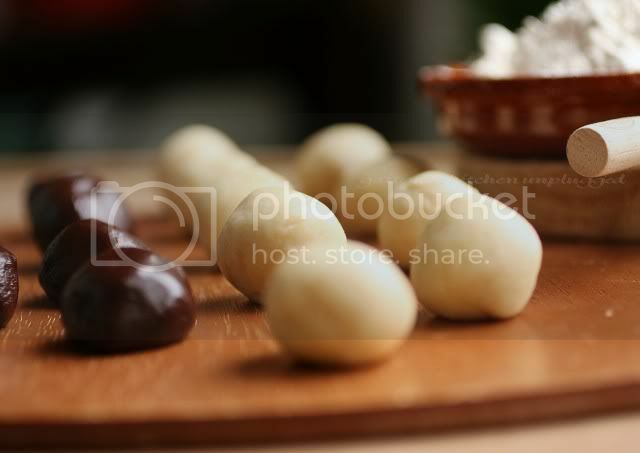 Divide it into smaller balls, each weight 20g. 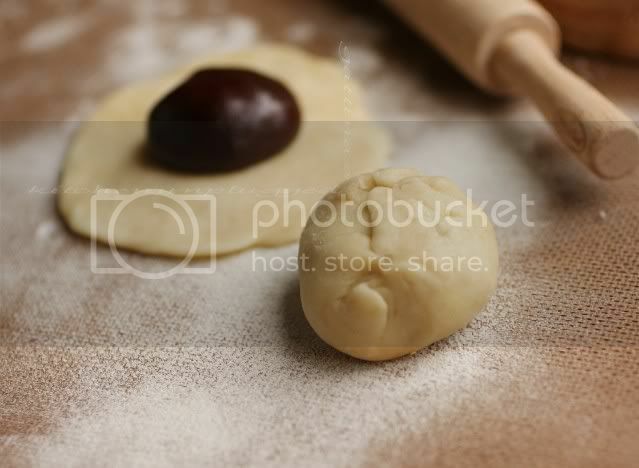 For Dough B, well combine the flour, oil, sugar, coco powder and salt until a dough is formed. Divide it into smaller balls, each weight 15g. 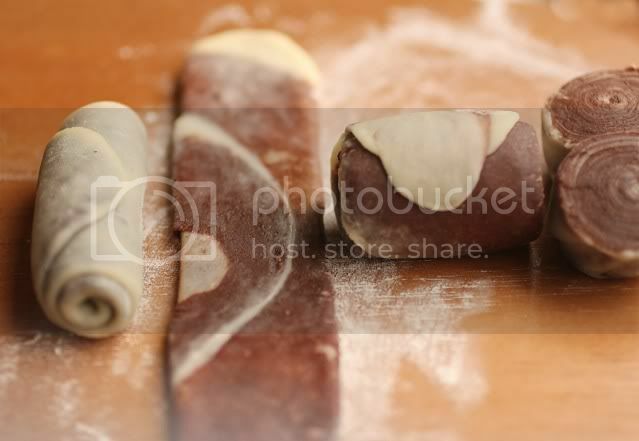 Roll one white dough to a flat circle, wrap in a chocolate dough, close the circle. Seal side up. Roll the ball to be a rectangle with the thickness near 5mm. I rolled it too thin and broke some laminates, ended up a less puffy pastry :( Roll up the rectangle. Place the roll-up vertically as the photo shows, the seal-side faces up. Roll it again and form a rectangle, this time it turns out to be shorter and rounder. Use a very sharpe knife to cut it into two halves, cut-sides face up, chill them in fridge for at least 10 minutes. 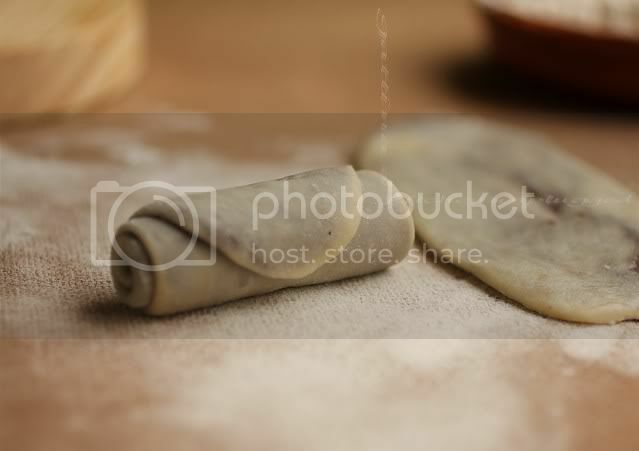 Turn the roll-up's cut-side down, roll it flat with a thickness of 3 mm, place the filling in the center, wrap up the dough and seal it gently. Bake the pastries in a pre-heated oven with 185C temperature for 30 minutes. 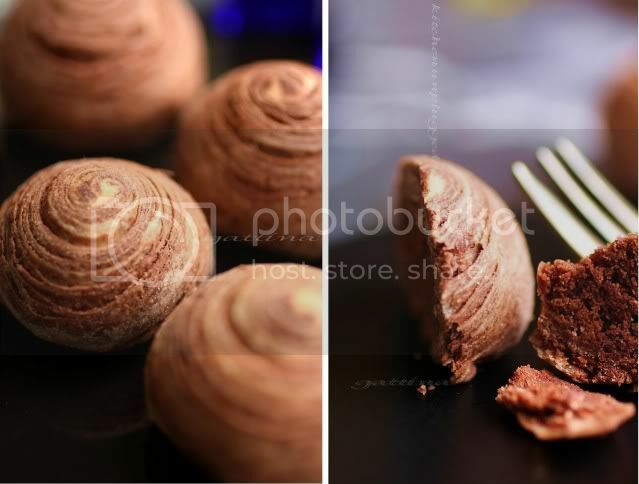 Depending the type of filling you use, otherwise the pastries store well for 4 or 5 days. note from me: I was aiming for a rather chewy texture similar to brownie, instead of bombons, so you'd find flour in my recipe. I don't totally satisfy with the result, need to work on it again. But the followings are what I did. 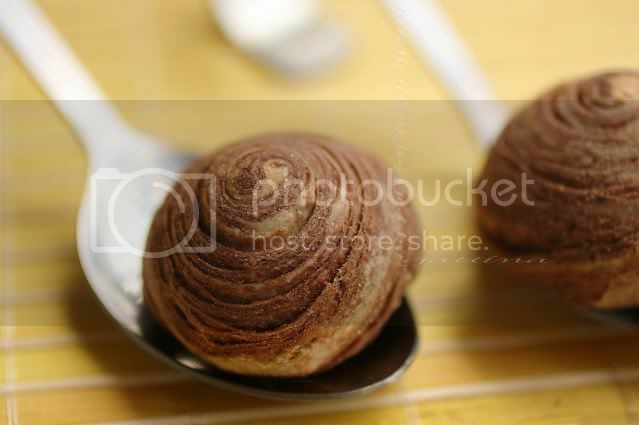 In a mixing bowl, whisk to combine the flour, coco powder, baking soda, salt. Set aside. Slowly melt the chocolate over a double-boiler. Once it turns smooth, remove from the heat, combine with corn syrup and the yolk (feel the temp of the chocolate which shouldn't be too warm). Then well-combine with the flour mixture. 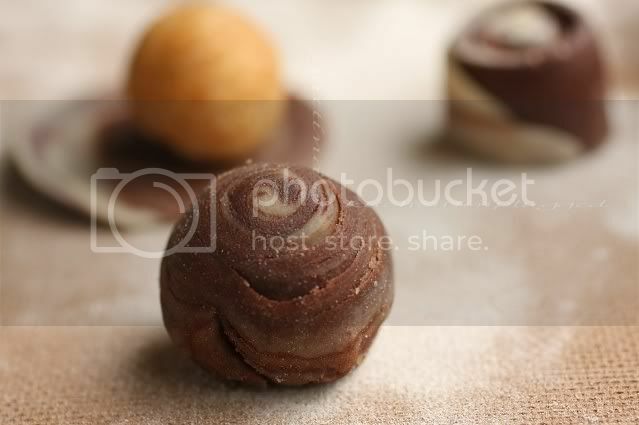 Chill the fudge in fridge until it sets, scoop up a spoonful and roll into a ball. Stunning and so pretty! A wonderful recipe! I have never had this looks so so beautiful. Wow, how marvelous!! Oh what a lovely lovely mouth full! Those are really cute and they look delicious! I might have to try them someday. Beautiful! Pictures are very attractive. If you say it's easy, I've to try. But when? This is pure lovelyness! I want 1 or 2 or 3 now,...please? Beautiful creation. How could anyone resist! Gattina, my dear, these are so precious! I love the sort of layered marbled effect. And the step by step photos are very useful, too! Oh my, it looks beautiful! As always, your creations are beautiful and looks delicious. Just very very beautiful. thanks for the step by step pictures, & flying the flag for your friend Angie. This is what warms me up to blogging. awesome post! I am lost half way reading the post. What a complicated process! How I wish I were just next to you watching the dough-making process. But I just can't resist the temptation to grab a bite. They are my favourite! Oh G, these look so awesome. If you ever drop by in Singapore, please do buzz me. I need to invite you to my kitchen for a demo. hahaha and follow by tea of course.